Wonder Woman fans! We have a fun giveaway for you of some swag being used to promote the film. 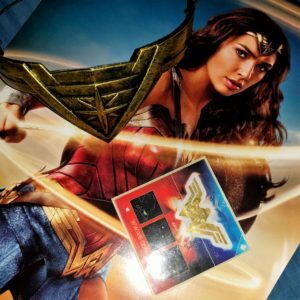 Enter now if you’d like to win an Wonder Woman poster, Tiara, and sticker. You have until Sunday, 4th June at 8pm PT to enter when we’ll randomly select our winner. * Because of the prohibitive cost of shipping abroad, we regret that this contest is only available to ship in the United States. I tried to + it on Google+ however this post is not there. I followed and RT’ed on Twitter under the handle @capesandcovers!